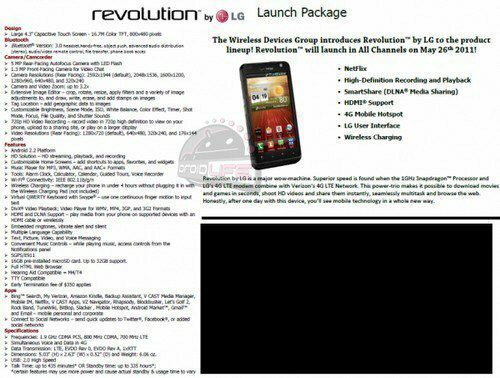 The LG Revolution will be the 3rd 4G enabled smartphone to play nice on Verizon’s 4G LTE network, and it was presumed the Android handset would have been launched by now but was delayed; however the LG Revolution launch date has now been confirmed. According to an article over on Engadget, the guys at Droid-life have discovered documents that confirm the LG Revolution will launch on Verizon as of the 26th of this month, and will come with Netflix. The Android 2.2 Froyo LG Revolution will be Verizon’s first 4G LTE device that will carry Bing rather than Google Search and will also apparently launch with Qi wireless charging as standard. Other spec for the LG Revolution include 4.3-inch touch screen, 5 megapixel rear auto-focus camera with LED flash, 720p video recording, 1.3 megapixel front facing snapper, 4G mobile hotspot, 1 GHz Snapdragon processor, WiFi, HDMI, and a preinstalled 16GB SD card, but I’m sure you knew that already. As for pricing for the LG Revolution, Verizon hasn’t announced that just yet, but for those contemplating picking up the LG Revolution, you can check out the user manual by going here. Previous article Previous post: Nokia N9 with 12MP Camera Video Teaser: MeeGo or Anna?